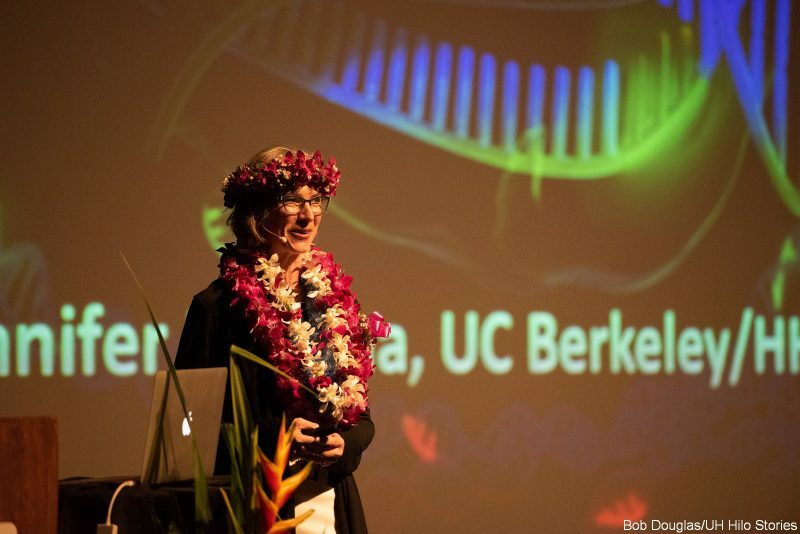 Prof. Doudna gained international renown when she and her colleagues at UC Berkeley were the first to develop the CRISPR-Cas9 genome editing technology that enables scientists to edit the DNA of any organism. The implications are revolutionary. 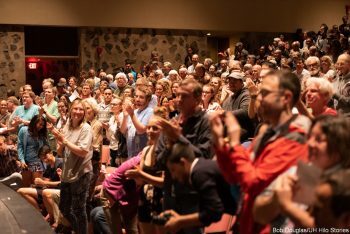 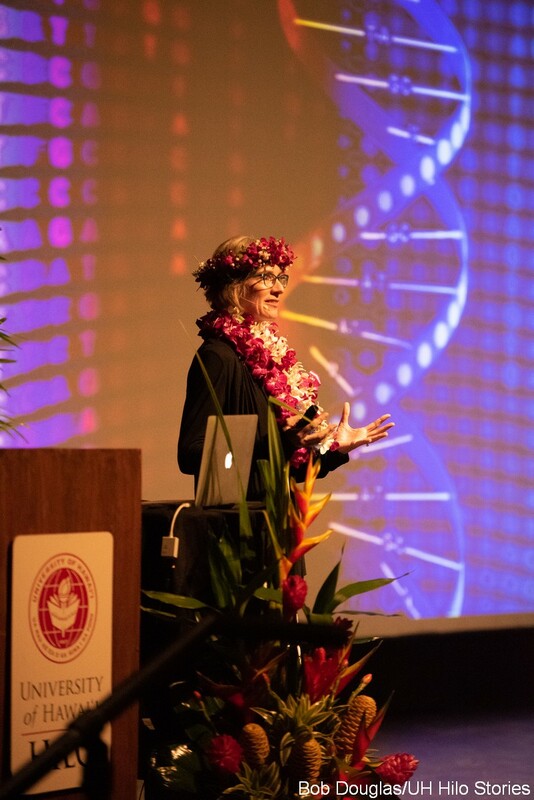 Jennifer Doudna delivers her lecture at the UH Hilo Performing Arts Center, Sept. 17, 2018. 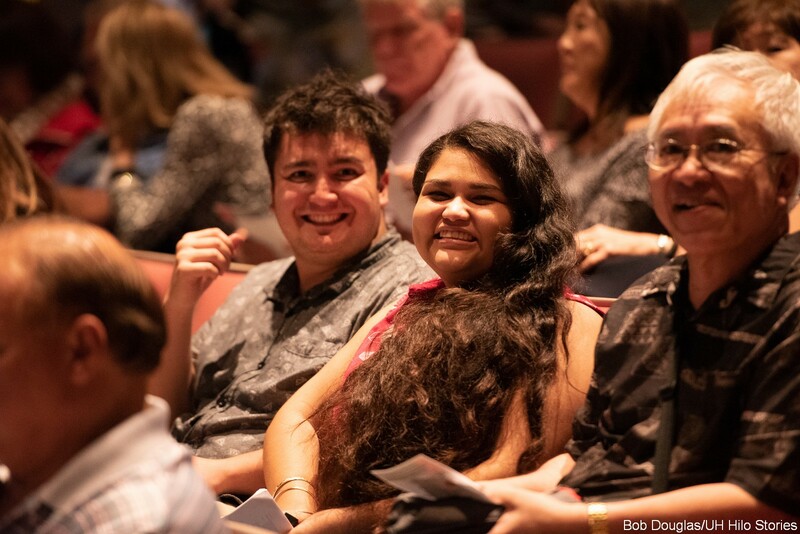 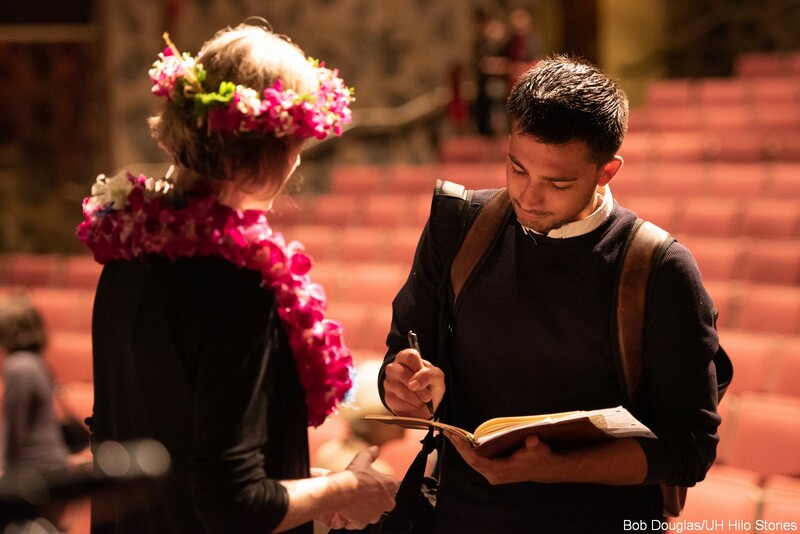 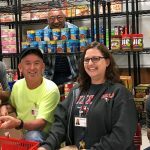 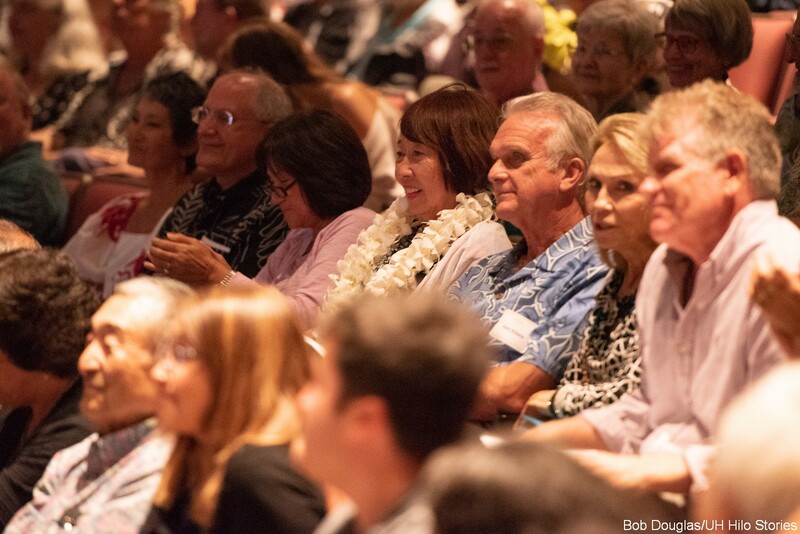 Photos by Bob Douglas/UH Hilo Stories, click to enlarge. Doudna was born in Washington, DC, and moved to Hilo with her parents when she was seven years old. 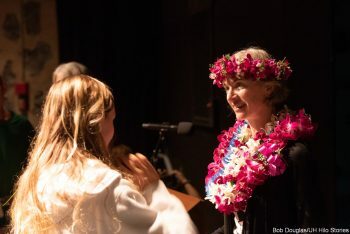 She is a 1981 graduate of Hilo High School. 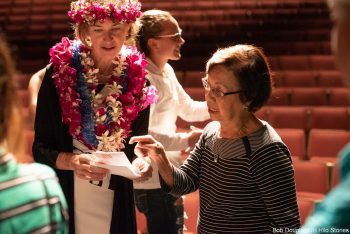 Her father, Martin Doudna, was an English professor at UH Hilo, and her mother, Dorothy Doudna, taught history at Hawai‘i Community College. 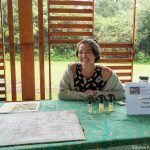 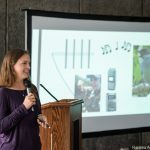 Doudna credits UH Hilo biology professor emeritus Don Hemmes with inspiring her curiosity about the living world by giving her a chance to work in his lab on campus. 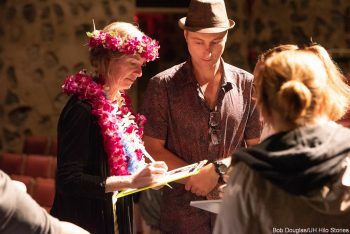 Hemmes is an internationally known expert in fungi, notably mushrooms. 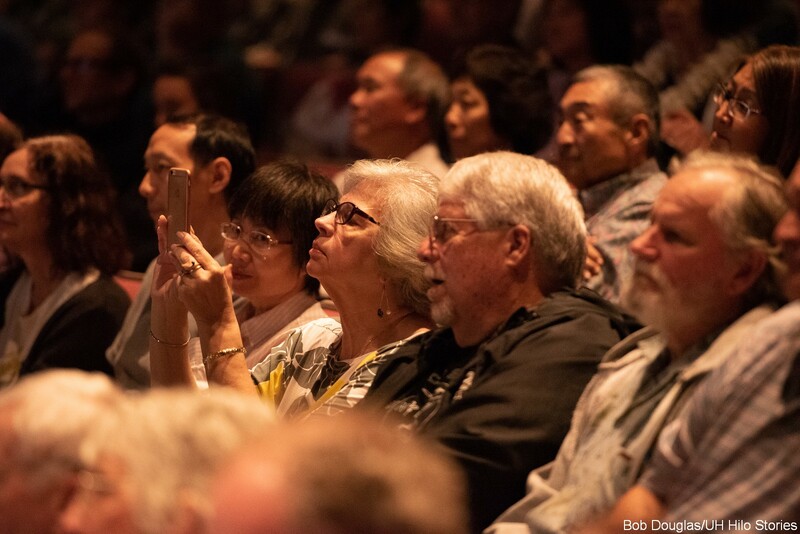 CRISPR-Cas9 technology is expected to have revolutionary implications through its human and non-human gene editing applications, including advances in agricultural methods, medical treatments for illnesses like Huntington’s disease, and mitigation of environmental damage. 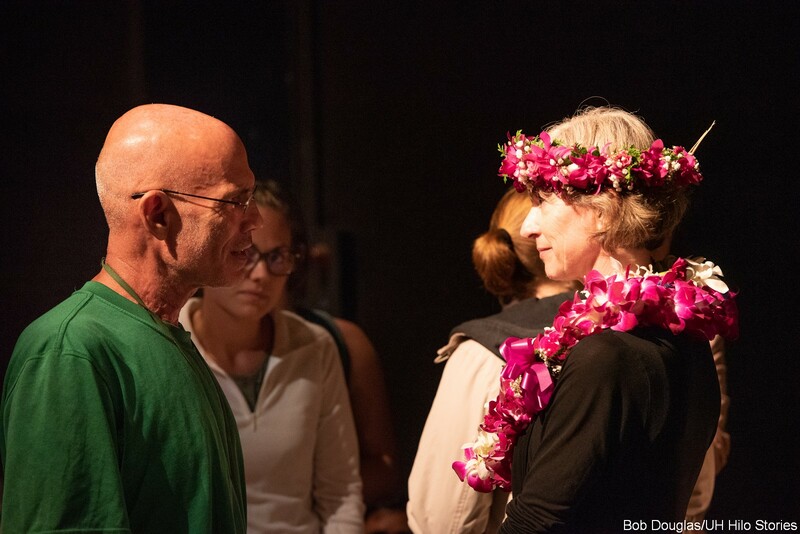 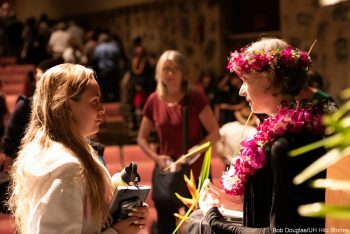 At a reception before her lecture, Doudna cites the example of the ʻōhiʻa trees on Hawai‘i Island, which are rapidly dying due to the ceratocystis fungus, as an example of an environmental problem that could one day be solved through gene editing. 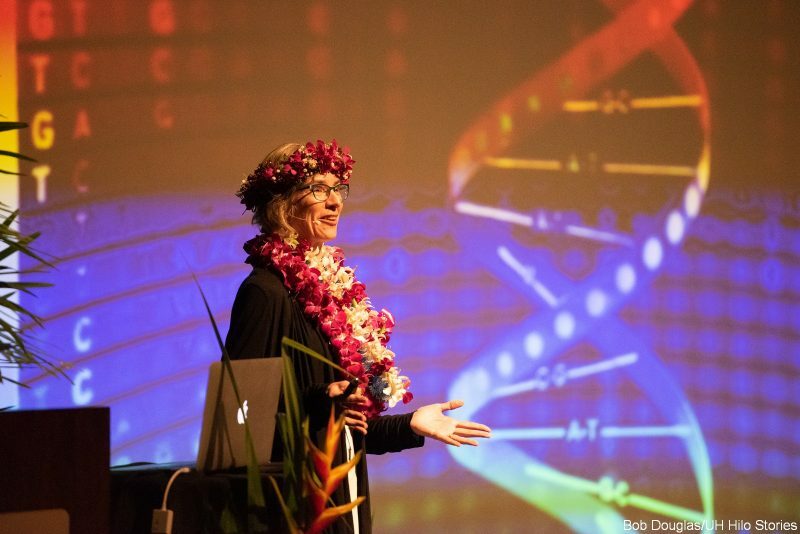 In her lecture, Doudna notes that early in the history of genetics, the idea of gene editing seemed fanciful, but in retrospect one can see the progression of technology that led to the CRISPR discovery. 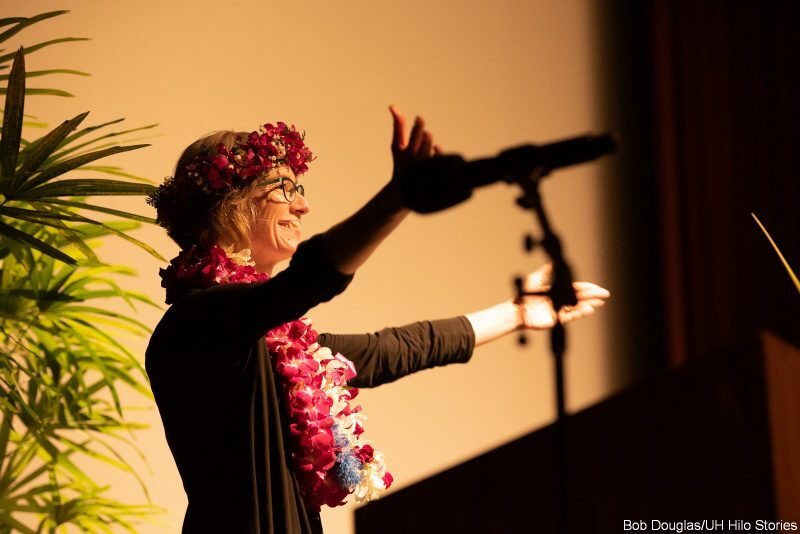 Doudna tells the audience how she felt the moment she realized that CRISPR-Cas9 could be used for genome editing. 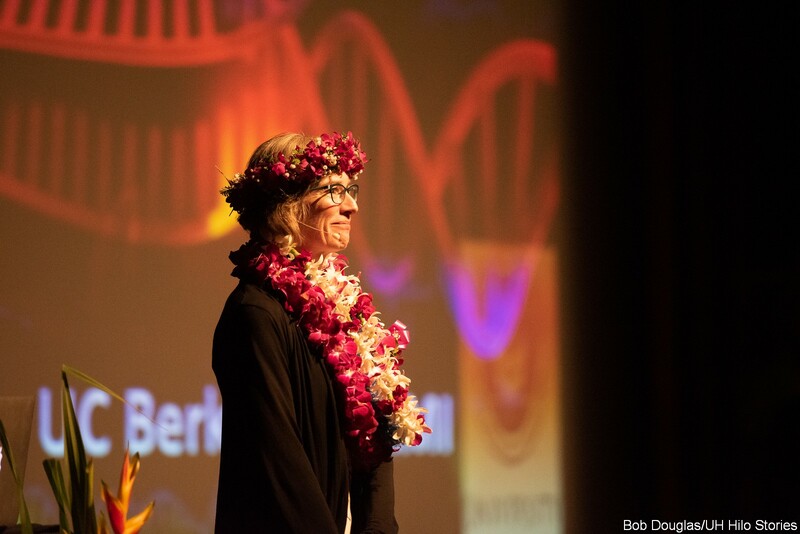 Doudna says historically, the RNA molecule was considered less important than the more glamorous double-helixed DNA molecule and the cell proteins. 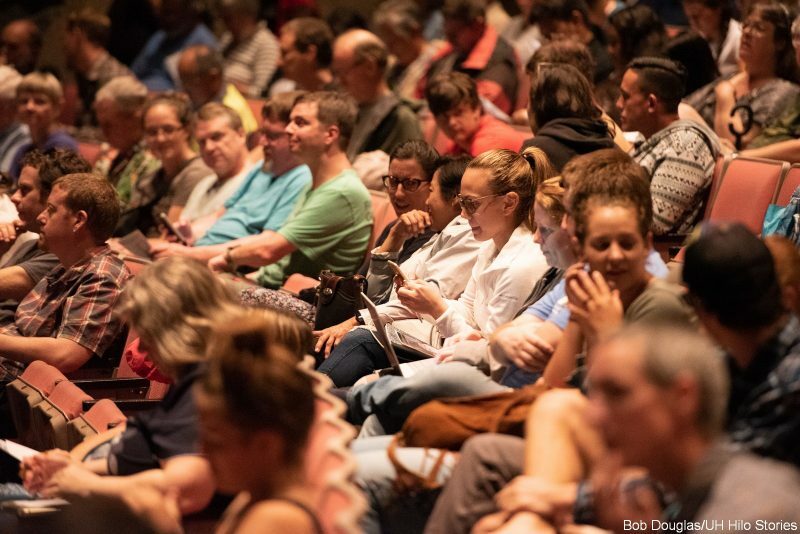 Today, however, it is understood that RNA molecules that are made in cells have interesting functions and three-dimensional shapes that allow them to do chemistry. 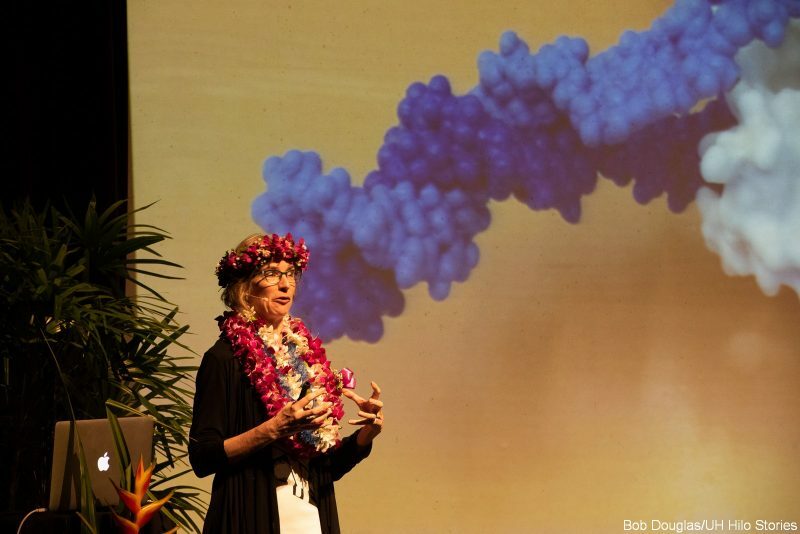 In the CRISPR-Cas9 technology, RNA plays a central role, with scientists creating a small piece of RNA with a short “guide” sequence that binds to a specific target sequence of DNA in the genome. 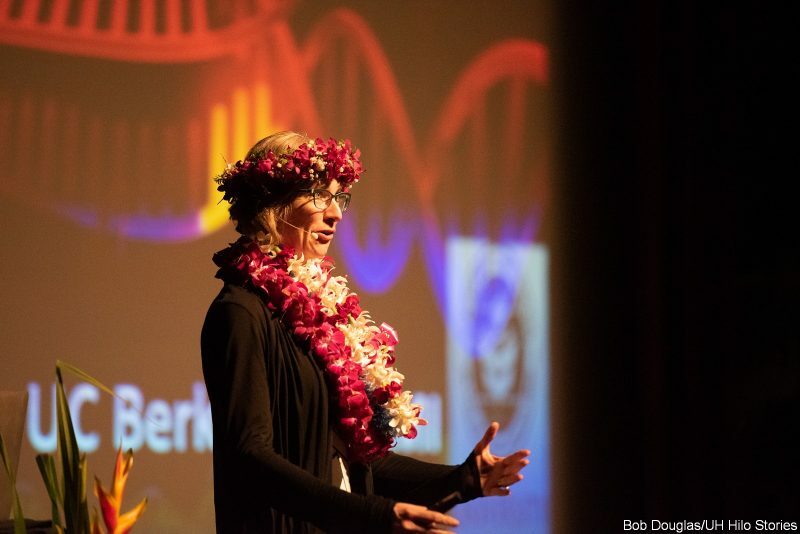 Doudna notes that she had studied RNA for a decade, asking questions about the fundamental nature of biology and investigating the functions of RNA molecules. 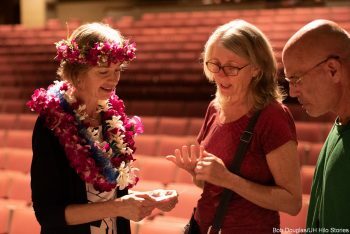 It was during these studies that one project led into an unexpected direction that led her to the CRISPR discovery. 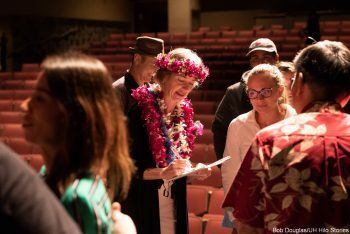 Doudna’s lecture was the inaugural talk of the Rose and Raymond Tseng Distinguished Lecture Series at UH Hilo. 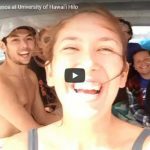 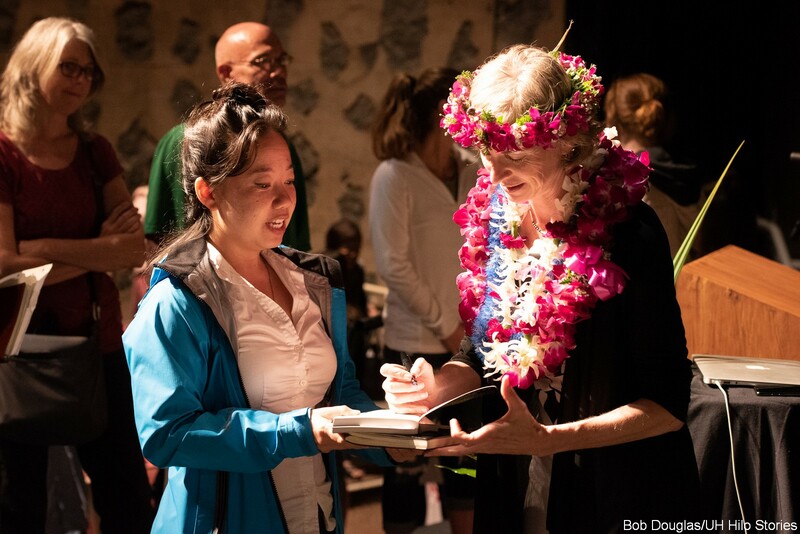 The series is supported by an endowed fund started by UH Hilo Chancellor Emerita Rose Tseng. 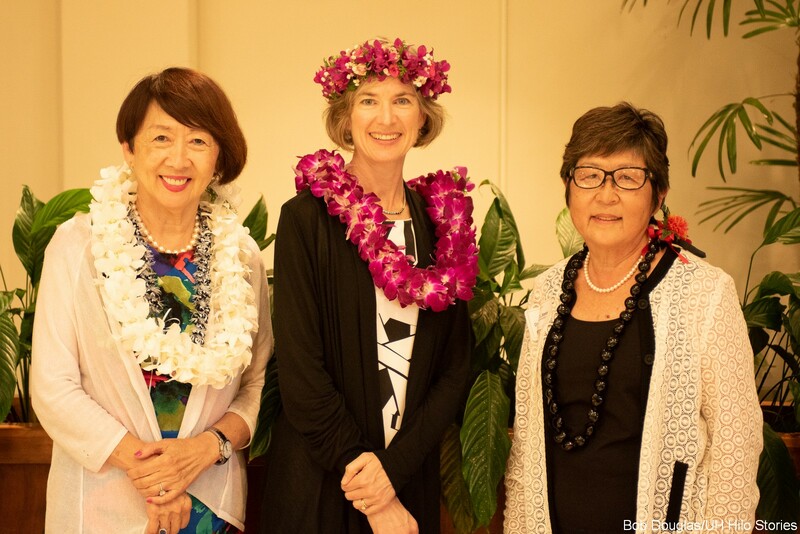 (Left to right) UH Hilo Chancellor Emerita Rose Tseng, Professor Jennifer Doudna, and UH Hilo Interim Chancellor Marcia Sakai at a reception held before Prof. Doudna’s lecture. Photo by Bob Douglas, click to enlarge. 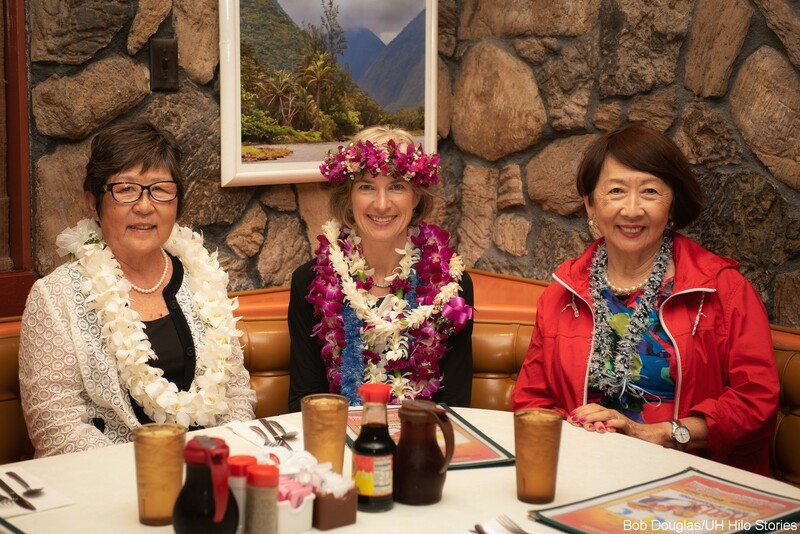 (Left to right) Following the lecture, UH Hilo Interim Chancellor Marcia Sakai hosts Professor Jennifer Doudna, and UH Hilo Chancellor Emerita Rose Tseng for a private dinner at Hilo landmark Ken’s House of Pancakes. Photo by Bob Douglas/UH Hilo Stories, click to enlarge.